Close friends and colleagues gathered at Amorina Pizzeria on Vanderbilt Avenue in Brooklyn last night. 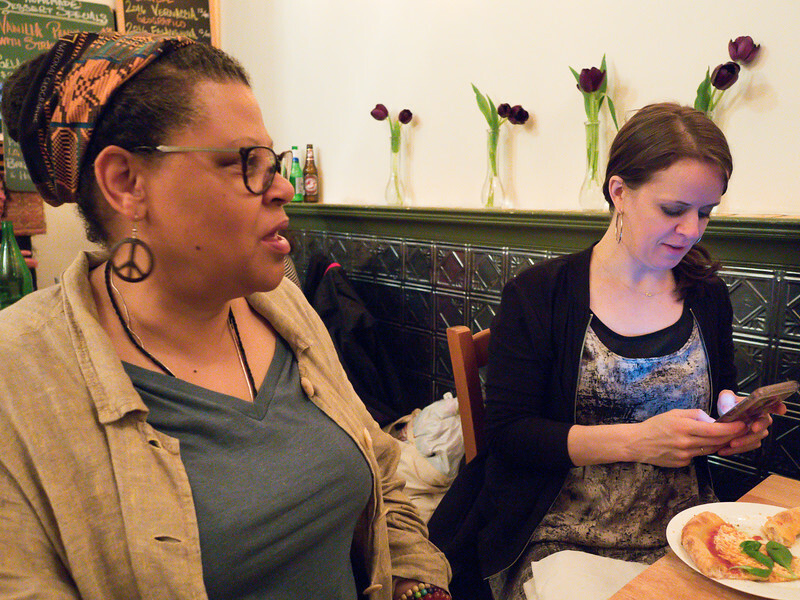 We were there to say thank you to Melissa Corbett, who since 2011, served as Brooklyn For Peace's full-time staff person and later its Program Director. As such she helped keep our peace organization functioning smoothly and performed every task conceivable—organizing Peace Fairs and our annual fundraisers (Pathmakers To Peace). She kept our membership database current (no easy task), kept the office stocked, ran off tens of thousands of flyers to be used in various street corner mobilizations and at street fairs, liaisoned with myriad other organizations, produced peace and justice buttons, chaired forums....the list goes on and on. It's sufficient to say that all of that an dmore could not have been done fully or successfully without Melissa's hands on the levers of organization. As such, she helped keep our organization and movementn alive and growing. Thank you, Melissa. We wish you the best and know that you are going to greater things in your life, wherever your path may lead. Veronica and Melissa (on her phone).